The California city wants to make the hateful restaurant the "gayest Chick-fil-A in the country." A California city has devised a colorful way to protest the opening of a Chick-fil-A at its local airport. The San Jose City Council voted Tuesday to surround the antigay restaurant at the Mineta San Jose International Airport with rainbow and transgender flags, reports The Mercury News. The idea came from a former county supervisor, Ken Yeager, a gay man who thought the flags could be used “as a counter-signal to the discrimination supported by Chick-fil-A.” The chain’s philanthropic arm made headlines recently after its tax returns indicated it donated nearly $2 million to anti-LGBTQ organizations in 2017. Prior to the vote, activists had gone to city hall Tuesday to file a protest against the airport Chick-fil-A, which is currently under construction and is slated to open next month. Other airports, like the Buffalo Niagara International Airport and the San Antonio International Airport, had decided to ban Chick-fil-A after the news of the anti-LGBTQ donations. But this particular restaurant “slipped under everybody’s radar” when the San Jose City Council approved its contract in 2018, said Councilwoman Magdalena Carrasco. Even the city’s mayor, Mayor Sam Liccardo, admitted he “simply didn’t think enough” when greenlighting the restaurant’s contract. In addition to the flags, the city council voted against a proposal that would have extended the contract of businesses that aren’t open every day of the week from 2026 to 2028. Chick-fil-A, which is closed on Sundays, would have benefited from this proposal. 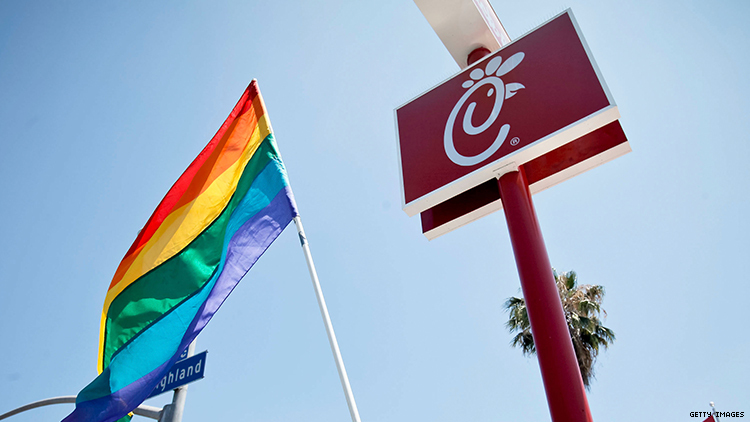 Councilman Raul Peralez says he is looking forward to the prospect of seeing the airport Chick-fil-A surrounded by LGBTQ flags, which would make it the “gayest Chick-fil-A in the country."